Human reproduction has changed quite a bit in recent years. It used to be that if a pregnancy was desired, it was easily achieved. Today, infertility is a growing problem and many couples must seek professional help to obtain the much wanted goal. Once a pregnancy is realized, the happiness and anticipation only increases as the birth date draws near. The day a woman ushers a new life into the world is arguably the most monumental time in her life. And yet, the following days can prove quite difficult. This is particularly the case if it is her first child; she may be unprepared for the fallout from sleep deprivation, radical hormone fluctuations and the extreme challenges associated with a crying baby. A new mother can easily be moody, irritable and embark on lengthy crying jags of her own. The good news is all of this is very normal and usually resolves in a short period of time. 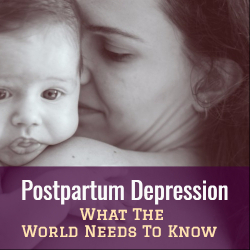 According to the Centers for Disease Control and Prevention, one in nine women will struggle with postpartum depression (PPD). It is unknown as to why one woman is impacted by PPD while another is not. This psychiatric disorder does not discriminate in the least; it can strike any woman regardless of age, race, ethnicity, or economic status. Women with PPD have but one thing in common: recent child birth. A new mother with PPD is fully aware of what she “should” feel. She should be full of joy and love that newborn more than words can say. But that is just not the case. Instead, she feels depressed, angry, moody or exhausted. Far from feeling extraordinary love, she may feel absolutely nothing, worse she could harbor feelings of contempt, even hate, for her child. These are very real and legitimate feelings, but they are diametrically opposed to what society tells her she should be experiencing. The shame and guilt is profound. Frequently, she isolates and tells no one due to fear of judgment. The truth is even without PPD, functioning as a new mother is already a challenging proposition in our country. To a large degree, our society is not kind or compassionate to these women. Magazines and media often showcase celebrities who are walking the red carpet, hosting reality shows, doing interviews seemingly hours after giving birth. They look glamorous, and most of all, thin. These same standards and thinly veiled expectations are unfairly applied to normal, everyday women. The pressure to be perfect and “do it all” is immense. Fortunately, recent efforts have been made to shed additional light on this disorder, often generated by celebrities. Years ago, model and actress Brook Shields told of her difficulty with PPD, and in recent months, model and author Chrissy Teagan has also done the same. These are wealthy, famous women in solid marriages. If anyone should be on the top of the world, it is these women. Yet, they hurt physically, mentally and emotionally, and dealt with tremendous shame, guilt and confusion as to why they were struggling so. In other words, despite the seeming perfection of their lives, they were no different than thousands of other women struggling with this condition. Increased awareness and education surrounding PPD is critical. It must be understood that the mother is not at fault. Not only does she deserve a proper diagnosis and help, but by the very definition of postpartum, at least one more life is involved…the life of the newborn. In addition, a person with severe PPD that goes untreated, can permanently harm or even kill her baby. If a new mother is failing to provide the necessary love, care and nurturing, it is not because she doesn’t “want” to, it is because she genuinely “can’t.” PPD is highly treatable. Medication, support groups and certain life style changes can mitigate symptoms and vastly improve life for all involved. If you suffer with any or all of the symptoms listed above, please get help. There is hope and effective treatment available.